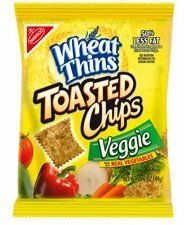 Wheat Thins Toasted Chips - Veggie. Your favorite snack is now available in a toasted chip. Made with real Vegetable, these chips have amazing flavor without the guilt of eating chips. Each bag is 1.75 oz.